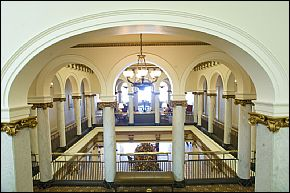 I was dropped off at the Capital Hotel after a long day of traveling. I opened the door and rolled my hard-sided bag with a "biodiesel" bumper sticker affixed to it across the tile mosaic floor. Clem (dear Clem), the late-night concierge, looked me over and without missing a beat, had my key in my hand. I can only imagine what was running through his mind I rolled away. My room was on the third floor, up a staircase straight out of "Gone With The Wind". 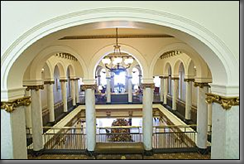 I passed the second floor with its forest of marble arched columns, the exact spot where I am pictured below, but I am getting ahead of myself. 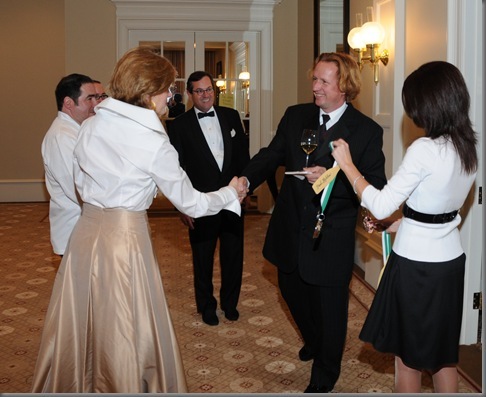 Me, shaking the hand of Cathy Mayton, Vice President, Episcopal Collegiate School Foundation. To her left is Emeril Lagasse. Next to Emeril, you can barely see Lee Richardson, who is the Executive Chef for the Capital Hotel. In between Lee and me, in the back, is Warren Stephens, President, Episcopal Collegiate School Foundation Board of Directors, and Chairman, President, and CEO of Stephens Inc. Micah Goff, to my right, Special Projects Coordinator Episcopal Collegiate School Foundation. 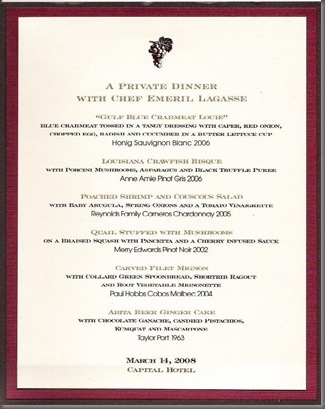 I'll fast forward to the day of the fund-raiser dinner for the Episcopal Collegiate School. I was dying to see the much-fabled kitchens. Louis, the assistant food and beverage director ( I thought of him as Radar as he always anticipated our every need), took me for a behind the scenes tour of the hotel. It has four kitchens! The STOVE inside the main kitchen has the footprint of most KITCHENS! There was an army of people preparing every detail for the night's dinner. I met Lee Richardson, the chef at Ashley's, where I had some of the best oysters of my life just minutes before. Early in my childhood, I lived just feet from the Chesapeake Bay, dragging oysters home for my poor parents to clean and cook. I know oysters! These were char-broiled in the shells, with just enough seasoning to make them sing. Just past chef Lee, I met Chris Wilson, Emeril's right-hand man in New Orleans. Chris was calmly orchestrating yet more food that was destined for the night's dinner. Past the kitchen, hidden deep under the hotel is a glorious wine cellar, with a polished table in the center. It is the site of more intimate wine dinners. Tonight's dinner, with its 40 couples and 5 winemakers, would take over Ashley's, and, later, the hotel. Anne Amie was to be featured alongside Honig Vineyards, Reynolds Family Winery, Merry Edwards Wines, and Paul Hobbs Winery. As the lone Oregon winery I definitely felt the pressure to show well. I felt a little like the country mouse visiting his city cousin. Here were wineries from Napa and Sonoma where it is customary to garden in a tuxedo. For me, the last time I had a tux on I was at prom. It was mauve. 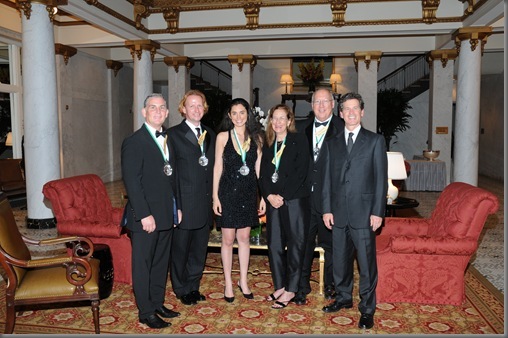 Pictured from left to right: Steve Reynolds, Me, Stephanie Honig, Merry Edwards and her husband Ken, Paul Hobbs. All the wines showed magnificently. I was especially pleased with how well the Anne Amie pinot gris melded with Emeril's crawfish bisque with porcini mushrooms, asparagus and black truffle puree. The acidity in the gris paired so well with the creamy bisque. The spice heat in the bisque was tamed by the fruit-sweetness of the gris. The rich truffle puree was lifted by the green apple and citrus of the wine. It was a perfect example of wine making food more interesting and vise-versa. The evening was a dream. So many wonderful people filled the room giving their time and energy for charity. Their reward was a great evening of food, wine, music, and camaraderie. The night held many hidden pluses. I made a great friend in Steve Reynolds. What a wonderful genuine guy. I don’t remember stepping on anyone’s toes on the dance floor. I was able to share our wine with so many people. And, I left Little Rock with a greater understanding and admiration for the city and its people. Thank you Clem, Louis, Graham, “Grace”, and, especially, Chris and Lee for their inspired cuisine. Thank you Warren. Thank you Emeril. Let's go back to 1994. Nancy Kerrigan is whacked with a metal bar. ER and Friends debut on NBC. Kurt Cobain takes his life at 27. Forrest Gump is running across U.S. screens. I am in NYC- a modern dancer performing with the Nikolais Louis Dance Company. My best friend, Christian, lives in Hell's Kitchen. 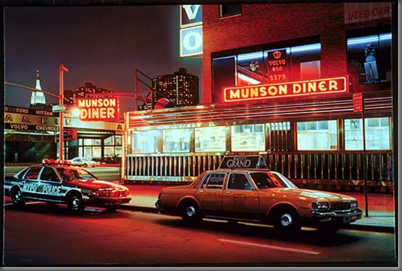 Not today's Hell's Kitchen, with its fancy condos and gleaming, trendy restaurants, but a 90's Hell's Kitchen. 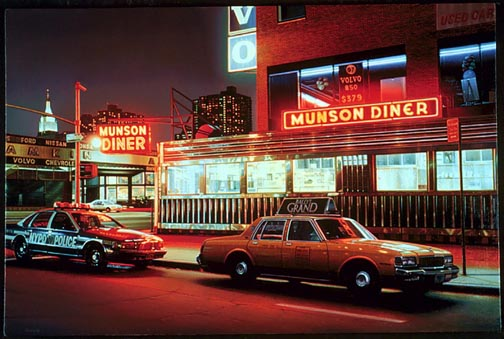 It is a neighborhood of sirens, bodegas, shadows, and cat-sized rats. Christian and I have a ritual. Since we are both from restaurant kitchen backgrounds, and since we brew homebrew together, and most importantly, since Christian has cable, we meet at his house with microbrew in hand and turn on the telly. There is a new network called the Food Network and we are entranced. It's like nothing we've seen before. There is this guy, Emeril Lagasse, and he is cooking (kickin' it up a notch) in a way we have never seen on television. It is what we now know as "edutainment". But, for two ex-kitchen guys like us it is a way to re-live the good ol' days and be inspired. Inevitably, it led us to the corner bodegas for supplies and a foraged dinner was prepared. Let's flash forward to 2008. I am asked to present my wines at a benefit dinner. The chef for the evening is none other than Emeril Lagasse. I jump at the opportunity! Emeril has done so much to get people eating outside of our cultural boundaries. He has inspired a generation to try new foods. The Food Network has brought new ideas about cooking into our living rooms. My goal is to do the same with wine. I didn't grow up with wine. I grew up with sweet tea. But, I have found a world outside of what I knew. A world of wonderful flavors. A world of traditions. A world that I hope to share with others. I make wine that is, if nothing else, food-friendly. And, I love nothing more than talking to others about what we do in Oregon- how our wines at Anne Amie reflect what we are passionate about and how our terroir is reflected in every bottle of our wine. So, it is with great pride that I packed myself off for an opportunity to pair my wines with the food of someone who I have so much respect for. 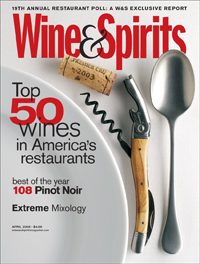 Anne Amie Pinot Noir is featured in the new edition of Wine and Spirits Magazine. Click on the link below to see their comments on our wines. They awarded our 06 Cuvée A Pinot Noir 90 points and our newly released 05 Winemaker's Selection Pinot Noir a Best Buy. I have just returned from a wonderful trip to the South. Bill Walker, our representative in Arkansas set up quite an impressive agenda for me with visits both in Little Rock, his home town, and a day in Memphis. Little Rock impressed me with wonderfully warm, hospitable people, great food, and a lively nighttime scene. It was amazing to see our wines on so many wine lists at restaurants and wine bars, as well as being sold by passionate, knowledgeable salespeople in wine stores. And, of course, a huge thank you has to go out to Moon Distributors, who are our voice in Little Rock. Thank you all, for being such staunch supporters of what we are doing here at Anne Amie! Pictured above, was one of my favorites stops , a wonderful down-home haunt in downtown Little Rock called the Flying Fish restaurant. Bill and I are in front of a whole wall of singin' Billy Bass fish. You see, if you bring in your Billy Bass and sign the appropriate adoption papers, you can walk away with a free catfish platter , and your Billy can school with hundreds of others. I love irreverent humor and impromptu art and I think this place just struck home- not to mention they had frog legs on the menu! I would also like to mention Ferneau, SO , and the Crush Wine Bar. All three places are worth a visit when in Little Rock. To see our wines placed next to creative dishes prepared by the likes of Donnie Ferneau is wonderful. Donnie makes a mean crab cake that just screams for some Anne Amie pinot gris to be paired with it. In Memphis I visited several accounts including the mind-boggling Buster's, which had a whole section just for Port and Sherry. For a fortified vinophile such as myself, I had to exercise extreme caution while I was there. My thanks to Chris Glanker and his crew at Athens Distributing for all their hard work introducing Anne Amie to the Memphis area. I'll talk more about the Capital Hotel and Emeril's dinner next time I check in. Until then, embrace your inner Southerner. The Low Country cooking of the Carolina and Georgia coast is one of America's great traditional cuisines. I was glad to find out how well our wines went with these dishes on my recent trip to South Carolina, where I was treated to the warm southern hospitality of our innovative distributor there, Advintage Fine Wines, and owner Henri Gabriel. The week started with a great day in Greenville and Spartanburg put together by "Juice Pusher" (everyone's title at Advintage) Aldo Morales that included lunch at the bustling Pomegranate on Main with some of the area's best restaurateurs (pictured here, Aldo is second from left). The day ended with a tasting for about thirty of Tony Forest's customers at his excellent wine shop, Carriage House Wines in Spartanburg. The next day was a whirlwind with energetic Juice Pusher Leigh-Ann Beverley. We raced from account to account and finished the day as evening was starting to fall with Manoli Davani Grayson (pictured here right with Leigh-Ann on the left) who shared with us some of her interesting wine by the glass selections at her Avondale Wine and Cheese Bar including a Cassis Blanc and a pinot noir from Alto Adige. Next was a day in Hilton Head rubbing elbows with the rich and famous along with Juice Pushers (pictured here left to right) Dianna Duncan and Jennifer Teed Lewis, who tag-teamed me from account to account all day long. Big congratulations to Jennifer who just announced she is expecting in September. Dianna and Jennifer have Anne Amie wines placed in all the best restaurants of the luxurious Hilton Head market. The week ended with a sales meeting with Henri and the entire Advintage staff who have done a outstanding job as our Anne Amie wines are well-known throughout the state and are available at many of South Carolina's best restaurants and wine shops. Many thanks to the everyone at Advintage who organized such a wonderful week for me in South Carolina. The ongoing Oregon Road Show pulled Director of Viticulture Jason Tosch and myself into the Big Apple for a week of promoting Oregon wines and the sustainable agriculture we practice under Jason's leadership: L.I.V.E..
We kicked off the week with the very well attended Oregon Road Show event at the elegant W Hotel (who was pouring Anne Amie by the glass) followed by the New York Wine Expo and working with our distributor in New York, Domaine Select Wine Merchants. Larry Rieter and his sales staff (pictured here, second from left, with Jason, left, and his Manhattan sales team), who have Anne Amie wines placed on key wine lists throughout Manhattan. 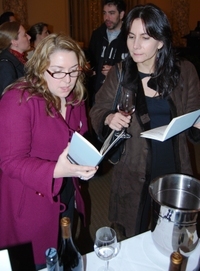 Pictured right are Domaine Select sales people Jenny and Joanna tasting our wines at the Oregon Road Show event. One of the highlights of the week was Jason's presentation on Sunday about sustainable agriculture for wine grape growing at the New York Wine Expo in the massive Javits Center. One of my favorite moments of this trip happened while we were dining with Larry and some customers at the the famous Gotham Wine Bar and Grill and I turned around to see Wine Director Michael Nelson serving our Pinot Noir to a table near ours. There is still nothing like the thrill I get at seeing people drinking our wines at such a wonderful restaurant. 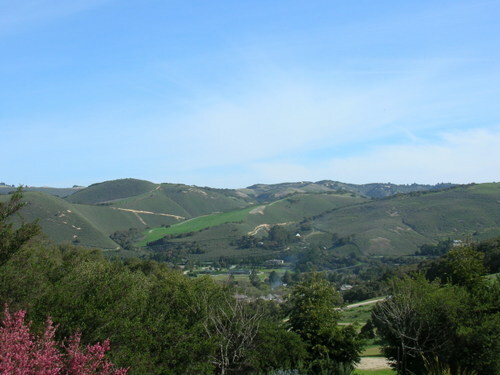 So, I’ve been on the road for 8 straight days and last night I really wanted to be at home in Portland but when I woke up this morning to the sunshine and beauty of the Carmel Valley, somehow everything seemed okay again. Today I visited our good friend Stephan Kidder who left a short stint at Anne Amie last year to become winemaker for Chateau Sinnet here in the Carmel Valley. 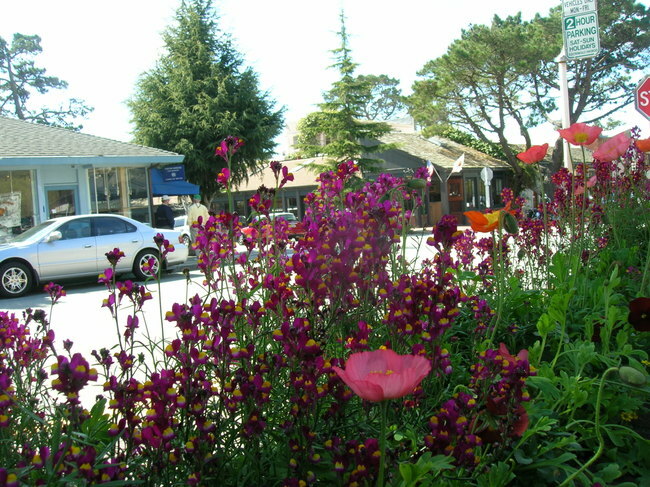 Stephan lives on a very cool compound – a place that used to be a hangout for celebs like Clark Gable and Marilyn Monroe. How cool is that?! After a visit to the compound, we checked out the sites like The California Mission San Carlos – one of the oldest buildings in California before enjoying lunch at Village Corner in Carmel Valley by the Sea. This place has the longest salad list I’ve ever seen. What do you expect from a place that has such a warm climate – you can grow salad fixin's here all year long! 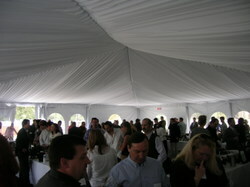 The main event of the day was the Henry Wine Group’s Spring Trade Tasting held at the beautiful Carmel Valley Ranch. 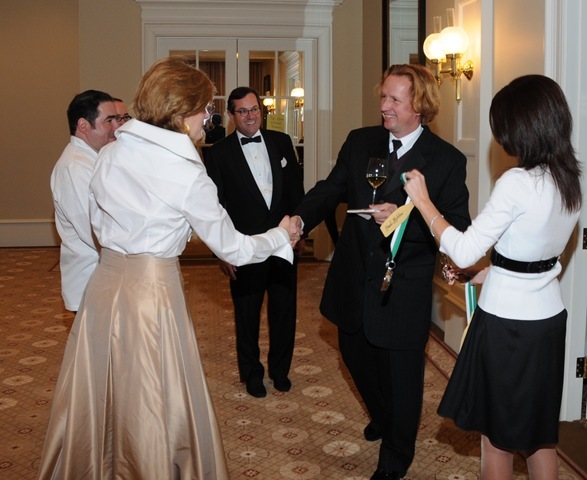 Over 50 wineries in Henry’s portfolio poured for local restaurants and bottle shops before a feast in the ballroom. Thanks to the Henry Wine Group for putting on such a great event and to California for being big supporters of Anne Amie wines. Today was really fun. It’s warm and gorgeous here and I wouldn’t have traded it for the world but I still can’t wait to wake up tomorrow and come home to cold, rainy Oregon! While my time in Atlanta was limited, I got a very good idea of what's happening in the food and wine scene down here. 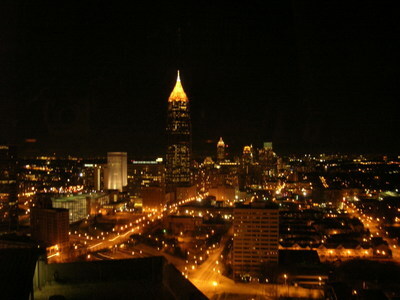 Now, I've been to Atlanta many times but for music, not for any sort of culinary journey. This time it was different and I learned that the good folks down here have taste – good taste! Ryan Mullins from Quality Wine & Spirits and I kick started the beautiful 70 degree day with the top down in the rental car. First stop was Murphy's, a restaurant and retail wine shop in the trendy area of Virginia Highlands. This place is cool - great cuisine with local, seasonal ingredients - just like we like it! It’s more than just a restaurant - they have fun, knowledgeable staff, weekly tastings and you can even “rent a wine guy”! Thanks to owner Tom Murphy for his generosity and the rest of the staff for enjoying and selling our wines! Pictured right is Murphy’s owner Tom Murphy with Ryan. 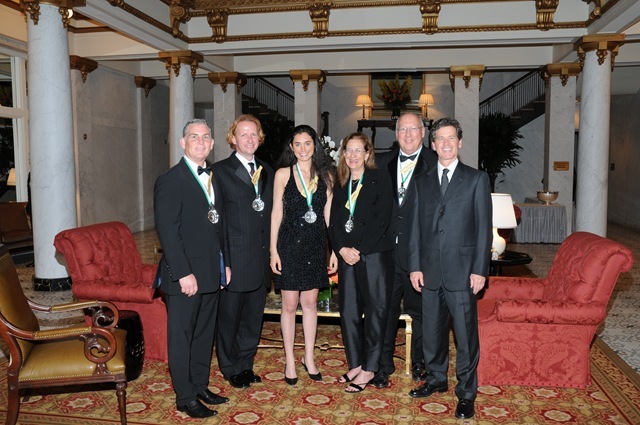 We also visited the prestigious Atlanta Athletic Club which was founded in 1898. Thanks to David & Alan, club members will now be able to enjoy our 2006 Pinot Gris and 2004 La Colina Vineyard Pinot Noir. Now if you find yourself in Atlanta and want a fun, hip place to go for dinner or a cocktail, Two Urban Licks is the place to be. This converted warehouse is tricked out w/ gardens and bocce ball in the back overlooking the Atlanta skyline. The bar houses 42 barrels of wine produced exclusively for the restaurant and the kitchen has an impressive 14 foot wood-fire rotisserie! The day was fun thanks to Ryan as my guide. Not only is he a wine lover, enthusiast, student, fanatic if you will; he is an avid outdoors man - a kindred spirit for those of us living in the Pacific Northwest. If you want to take an expedition to Alaska, hike, rock climb, fish, watch bears and at the end of it all feast on salmon that you caught yourself paired with an amazing bottle of wine...Ryan is your man. Many thanks to Rick and Jeff and the rest of the crew at Quality for sharing the same enthusiasm that we do about the wines of Anne Amie. We are so happy to be with this great operation in Georgia (named in Entrepreneur Magazine’s Hot 500 companies!) Not only do they know their stuff, they've got that southern hospitality that can't be denied. What does Anne Amie Vineyards and Covey Run Winery have in common? dinner hosted at Giorgio's restaurant in the Pearl last Wednesday, there was more than just superb wines paired with wonderful food. 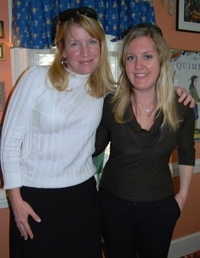 I was pleasantly surprised by what Covey Run's winemaker, Kate Michaud and I had in common. We had both worked making "sauvy" in Marlborough, are yoga junkies, love to roam thrift stores, and don't eat meat. The wines, though very different in styles, played well with the beautiful courses prepared by executive chef, Peter Schuh- some almost too pretty to eat! To share an evening of great food and wine while raising money for Portland charities was a great experience. 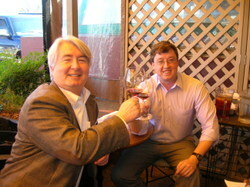 To share that kind of evening with a kindred spirit in the winemaking world was even better.